Welcome to the W8MD medical weight loss centers of America’s unique insurance physician weight loss and sleep wellness program of New York City, also available in other states and cities including New Jersey, Philadelphia and other places. Here are a few weight loss testimonials, and patient reviews of W8MD medical weight loss program by actual patients that have used our weight loss program. 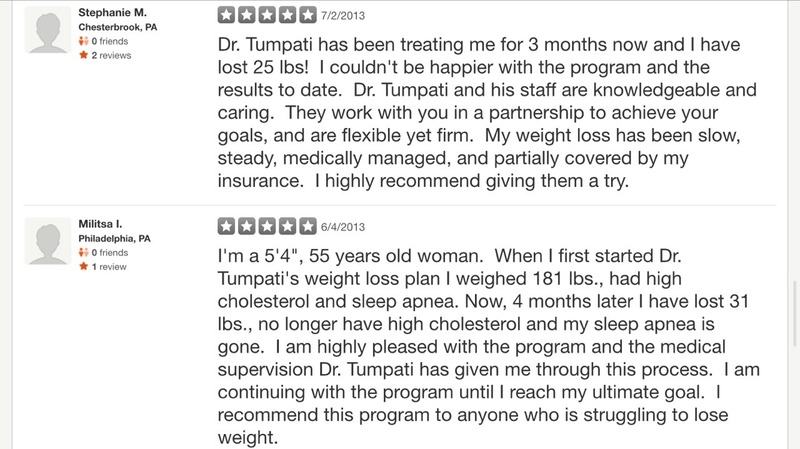 You can also find more reviews of actual patients that have used the W8MD medical weight loss program and lost weight* in New York City under the testimonial section of W8MD. My initial consultation here was for sleep apnea. I am also quite overweight but years of failure at the usual methods had me convinced that there was no hope on that issue. After dealing with the Apnea, Dr. Tumapti diplomatically asked if I was interested in dealing with the issue of my weight. I explained my many failures in this regard and he informed me “It is not your fault”. He is the first person EVER to say such a thing to me. Even those who did not directly say it was my fault implied it, or I felt as if they did. Dr. Tumpati proceeded to educate me about obesity and why it happens. He is knowledgeable , non judgmental and skilled in helping patients design the program that works. So, for the first time in twenty years I am actually losing weight. I have lost about 60 pounds since June; from a size 22 to a loose 16. I can bend over and tie my shoes, my knees work without complaining and I no longer need blood pressure medication. The staff at w8md is very supportive,and the Doctor is great. I’m so happy with my 40 pounds of weight lost in 5 months. If you really want to lose weight and feel great this is the place for you. very knowledgeable doctor on the topic of obesity. I have lost 29 lbs in only 1 month and half. The center offers a very rounded approach to weight loss. I received Counseling, diet, exercise, weight loss medications suggestions. I have been pleased with my weight loss progress. Doctor put me on a diet and Belvig (Anti-obesity pill) and I am only eating about 1200-1500 calories per day. Very easy to make an appointment. My weight has been up and down most of my life….mostly up. Over the summer I tried to become more active by running but I did not alter my eating habits. I lost a little weight but the pounds were much harder to drop than they were in my younger.After seeing Dr.Tumpati’s ad in a magazine ,I decided to see Dr.Tumpati. I slowly started gaining weight for years. I would gain and then lose only about 5 pounds and then gain it back plus 5. I tried every diet, exercise regimen, detoxes, you name it I have probably tried it. All with no luck of losing weight. I had no energy, I have scoliosis in my back so I couldn’t stand for too long without it hurting, I tore a meniscus in my knee because of my weight and my knees swelled off on for a while. One day I looked in the mirror and truly did not like the way I looked and I started to feel depressed. I then went to the internet and did a search for weight loss alternatives to bariatric surgery. I came across Dr. Prab and went to my first visit and started the weight loss program. Because I work midnights my sleep schedule is all off. I had a sleep study done and it was determined I do not have sleep apnea; however, the lack of proper sleep and insulin resistance is the cause of the weight gain. I am currently on a very low calorie diet (VLCD). I drink four 100-calorie shakes a day, protein bars with a salad, lean meats, lots of veggies, prescription appetite suppressants, and many bottles of water. I try to stay away from fast food, sodium, sweets, and sodas. In the first week of this program I lost 5 1/2 and subsequently 3 pounds each week there after. I have only been on this program for a month and have lost 12 pounds!! It is definitely a life changing experience. It feels good to have people notice you are losing weight rather than gaining. My clothes are starting to fit loser and I am excited to get to my goal weight. I see the doctor every two weeks for a follow up and weight myself at home once a week. I still have 84 more pounds to lose, but at this rate it is definitely possible. After several years of putting on weight due to stress, and some failures with other approaches by myself, I had finally decided to seek support in my weight loss goals.I was looking for a program that was medically supervised, could provide support, made the decisions simple to comply with given my busy schedule, had and solid scientific and behavioral component and could provide medical support to assist with compliance with the program. It’s been a great match. The staff is friendly and knowledgeable, the Doctor is warm and kind and spends a long time with you during his appointments reviewing the medical basis of the program and your needs and any other health concerns you may have, the food selection is convenient for my work life, and the medication really does help you stay on the program. It’s definitely easier to follow the 1,000 calorie diet with the medications help. I’ve been steadily losing roughly 2-3 pounds a week since the end of July – right in the safe zone. About 50lbs so far. And I’m right on target to make my goal weight at perhaps the end of January – mid February. Which is ambitious – back where I was in my 20’s and right where the BMI Chart says I should be. I feel better. I sleep better. I can do more than I could. My blood pressure medication has been reduced & will likely be completely eliminated. And I like fitting into clothes that I couldn’t consider just a few months ago. I’m looking forward to the warmer weather again for the first time in ages! My primary doctor referred me to Dr. Tumpati (Philadelphia) for an updated sleep study for my sleep apnea. While being treated for sleep apnea Dr. Tumpati explained the weight loss program and metabolic syndrome in which he treats. It took several visits and coaching from Dr. Tumpati to convince me that W8MD will be a fit for me. After a routine visit, I took the first step and made an appointment to see him for weight loss. My start weight was 218 lbs. and was placed on 1200-calorie partial meal replacement program. Between the W8MD program (once a week check-ins with Laura) and 30 mins. Of exercise three times a week, I lost 42 lbs. over a 7-month period. The change in my life is astounding: Before I could not bend over with cutting off air circulation, my sleep apnea was getting worse, I was a size 38, and a flight of steps was a challenge. Today: I have no problem bending over, sleep apnea is gone and I am off CPAC, I am size 33/34, and steps are no problem up to 20 stories! I owe a great deal of thanks to the W8MD clinic (Dr. Tumpati & Laura) for their knowledge, compassion, and enthusiasm.